What is in a McDonalds Egg McMuffin? The McDonald's Egg McMuffin is on Snack Girl's radar. 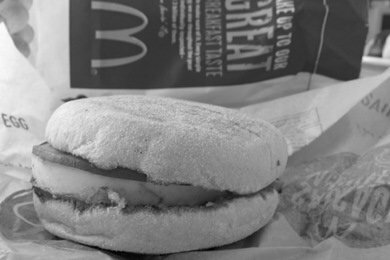 After reviewing, McDonald's Oatmeal she got a bunch of questions on the iconic McMuffin. So, once again, I trekked out to McDonald's for breakfast and purchased 2 Egg McMuffin's for $3. Ummm, look, before I go any further, I know many of you eat this for breakfast. My own mother, when she was an executive, used to pick up an Egg McMuffin on her way to work. Now she is retired and (hopefully) making her own breakfast. This is a typical "grab and go" meal and it is cheap and fast. But, it just tastes terrible. I know I am going to get flamed for this, but I found this breakfast sandwich completely inedible (and I will eat just about anything). There was a chemical taste that I found bitter and the CHEESE wasn't real cheese. It is processed cheese and it was the consistency of glue. You know what really shocks me? It is 820 mg of sodium in one sandwich. That s 34% of your daily value of sodium. But, I didn't buy ONE did I? So, I would have eaten 1640 mg of sodium - 68% of my daily value at breakfast. But, you are probably going to eat two of them. I wonder how McDonald's can mess up this simple sandwich. The ingredients should be simple. The Egg McMuffin is basically a breakfast sandwich including an English muffin, fried egg, cheese, and ham (AKA Canadian style bacon). If you eat these regularly, I want you to try something. Buy some whole grain English muffins, cheddar cheese, thinly sliced deli ham, eggs, and olive oil. Toast your English muffin, fry your egg in a little olive oil, and add the cheese and the ham. Taste it. Now, you know what an Egg McMuffin SHOULD taste like. Enriched flour (bleached wheat flour, malted barley flour, niacin, reduced iron, thiamin mononitrate, riboflavin, folic acid), water, yeast, high fructose corn syrup, sugar, wheat gluten, soybean oil and/or canola oil, contains 2% or less of the following: salt, calcium sulfate, calcium carbonate, citric acid, calcium citrate, yellow corn flour, corn meal, rice flour, barley malt, artificial flavors, natural flavors (botanical source), dough conditioners (ascorbic acid, azodicarbonamide, datem, tricalcium phosphate, monocalcium phosphate, enzymes, calcium peroxide), calcium propionate and potassium sorbate (preservatives), soy lecithin. Prepared with Liquid Margarine. This list is over 50 ingredients long! When I read a list like this, I just wonder if I want all these additives in my food. I realized the FDA has approved these chemicals, but I don't think they taste good and I think you can do better. What is your take on the Egg McMuffin? Hi, have you tried the vitalicious new egg sandwiches yet? I bought them at my Target. They are made by the vitalicious vita-top people. Vita tops are sold at Whole Foods so the assumption that I am making is that they are natural . Let me know what you think. They are not as good as your recipe above but are edible and high in fiber low in fat. Or you could head over to your local Dunkin Donuts. Here's its video for Smart Swaps ... http://bit.ly/ijWS3u ... from its head chef. Yep, DD has a chef. This could have been a SNL skit, but it's not. Another thing folks can do if they insist on eating this chemical nightmare is get the sandwich with just the egg and cheese, take the top off, and just eat it like an open-faced sandwich. This will eliminate a decent number of calories, and the bacon is a huge part of the salt. I love that you've suggested people build their own egg mcmuffin and compare that to the taste of the McDonald's version. I used to LOVE fast food. Thought it was great and delicious. That was until I started making my own meals with REAL food (although not necessarily the healthy version of real food, i.e. I use real butter, full fat cheese) and I've found that now on the off chance that I "treat myself" with fast food I don't even enjoy the experience. There really is very little flavor once you know what real flavor tastes like and knowing how much sodium and extra additives are in the food really ruins what little flavor is there in the first place. Even though I don't use the low-fat, low-calorie, low-sodium version of the foods that I do eat I still end up getting fewer of everything in the process. Since I have been eating healthy for years now, I haven't eaten at a fast food joint for a looooooong time. I probably haven't eaten one of these egg mcmuffins for over 6 years, but WOW! I didn't know there was that much sodium in one sandwich. All of the chemicals do not totally surprise me though. Ick! Makes me feel better about making our own breakfast sandwiches at home from small New England farm fresh eggs, Whole Food's english muffins, small farm cheese, and humanely raised meats. nomnomnom! Anyway - I am SO making the muffin frittatas. I make large ones and if our family doesn't eat it that day, it ends up in the garbage. I suppose I could freeze these too (will try) and it is a great grab and eat breakfast. Normally I always make my own breakfast. However, if I partied at a friends house and slept there, then on the way to work I'd pick one up because I wasn't at home to make my own breakfast and it was quick and easy... After reading these ingredients, I think that I'll plan ahead and pack a breakfast next time! i got an amazing rice cooker for christmas, and i now use it's wonderful timer to have my steel cut oats piping hot and ready to eat shortly after i wake up. i add flax seeds and bran to the oats along with cinnamon, and it makes for a great bfast. i also sometimes throw raisins and almonds on top, along with a little milk or soy milk. i often cook much more than one serving, store the leftovers in the fridge and am set for several days, with the help of my microwave. i buy most of the ingredients in bulk, so this bfast is also cheap. WOW! I had no idea how bad those were and they are supposed to be the good ones. Now, interestingly enough, this used to be my breakfast of choice (especially when pregnant, don't judge). They really do taste like cardboard though, so I decided to make my own. I use essentially the recipe above but I use canadian bacon. I will try it with the ham. Thanks for this one!! In my old job my boss used to buy these as a treat for everyone. My stomach used to turn but I'd eat some of it so he wouldn't feel bad. I much prefer the pb/banana quesidilla snack for breakfast. We make our own version of "Egg Mcmuffins" at home I serve them open faced with a scrambled egg, fresh herbs, canadian bacon, cheese and roasted red pepper. Hmm...I'm hungry. Panera has a "Breakfast Power" sandwich which is a freshly cracked and cooked egg, whole grain bread, cheddar cheese and one slice of thinly sliced ham. It is delicious. I won't eat any other "fast food" breakfast sandwich after trying Panera's. The only thing better is the kind we make at home. What's your opinion on Starbucks' breakfast sandwiches? Or Panera's, as the previous person commented on? I so appreciate your honestly. The truth is make it at home and not only will ingredients be ok they can be great (omega 3 eggs, no nitrite bacon, whole grain muffin). We posted today on healthier fast food options, come by Foodtrainers blog and let me know what you think. We have homemade breakfast egg sandwiches about once a week. I cook the eggs in the oven in silicon muffin cups - one egg in each cup, scrambled for the kids who prefer them that way and yokes unbroken for the rest of us. About 20 minutes at 350. They just dump right out of the cups without any oil and are the perfect size for a thomas' 100% whole wheat english muffin. It's a super easy way to make a fast and easy breakfast for 10 people at once. I love homemade "egg mcmuffins"! So fast to make and yummy. Thomas makes a 100 calorie thin english muffin that is good. I call our homemade breakfast sandwiches the "court mc muffin" we make them a lot. We also do breakfast burritos. It's simple and tastes DELISH!